After sharing the initial previews a week ago of Gem + Ade’s fantastic wedding at Sandon Hall, I’m delighted to share the full featured story here today. From the moment I first met Gem + Ade I felt connected to them, and this connection certainly showed through both the engagement shoot, and most definitely on the wedding too. 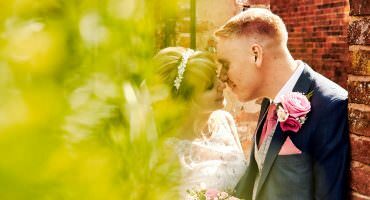 I always aim to become a natural part of the wedding with all my clients, as I believe if I’m a true part of the day, then the photographs reflect a truer, more emotionally deep story. I had an amazing time documenting Gem + Ade’s wedding from the preparations at the Hayloft in Gratwich through the personal and truly lovely ceremony at Sandon Hall to the incredible party on the night. I sincerely hope you enjoy sharing this insight into Gem + Ade’s big day. The day started with a wonderful relaxed start, documenting the preparation of the bride, her bridesmaid and the parents at The Hayloft Barns. Ade secretly sent a beautiful Pandora ring set for Gem on the morning – which matched the colour scheme perfectly. Having not one beautiful staircase but two made the day even more special – and I couldn’t resist taking the dress on a little photo expedition. The detailing on the bridal hair was simply exquisite. I had the chance to talk to Gem’s mom and dad during the morning and felt how incredibly special the day was for them, so it was no surprise to see the emotion start to flood out of Gem’s mom when she saw her in the gown. Ade and his brother had spent a relaxing morning in Stafford trying not to spend more money than they should at the Specialized shop! One very proud and emotional dad walking his daughter into the civil ceremony at Sandon Hall. The cars from Heritage Wedding Cars looked at fabulous as ever. Fortunately Gem and Ade were blessed with a stunning day from start to end, with the weekends rain unfortunately falling on Eve + Ian the day before. Ade couldn’t resist doing his little walk as we were heading through the grounds – I think Gem’s face says it all. The navy colour scheme looked perfect in the Saloon at Sandon. I always love photographing speeches, but the reactions on Gem + Ade’s day were simply priceless. Following the speeches, we took the opportunity to head back into the grounds and enjoy the early evening light. I had such an amazing time photographing Gem + Ade’s wedding – thank you both so much for entrusting your wedding to me.